NEW YORK -- Bernie Geoffrion and Bobby Hull became known for their powerful slap shots and nicknames of "Boom Boom" and "The Golden Jet." Andy Bathgate settled for just plain Andy. Hall of Fame winger Bathgate, one of the most prolific scorers of his day, has died. He was 83. Bathgate's death was confirmed by the Hockey Hall of Fame and by the New York Rangers on Friday. A dynamic shooter and playmaker, Bathgate was the NHL's MVP for the 1958-59 season when he scored 40 goals and had 88 points. He was the first member of the Rangers to score 40 times in a season. A two-time, first-team All-Star in an era when Gordie Howe was the dominant right wing, Bathgate played in eight All-Star games. He spent just under 12 seasons with the Rangers before being traded to Toronto in 1964, when he won his only Stanley Cup. One of Bathgate's most famous shots was on a backhander that crashed into the face of Montreal goaltender Jacques Plante in 1959. Plante then became the first NHL goalie to wear a mask in a game. Bathgate also played for Detroit and Pittsburgh in the NHL and Vancouver in the WHA during his 18 pro seasons. He scored 349 goals and 973 points in 1,069 NHL games and was inducted into the Hall of Fame in 1978. Considered one of the Rangers' all-time greats, Bathgate's No. 9 jersey was retired by the team - along with that of Adam Graves, who also wore the number - in 2009. When he was dealt to Toronto in one of the biggest trades in NHL history, Bathgate held every major Rangers scoring record. That included scoring a goal in 10 straight games, a mark that still stands for the Rangers. His trademark was a blistering slap shot at a time when "the slapper" was a far less popular weapon than it is today. But Bathgate also was a creative passer and a dependable performer who played in every regular-season game from 1958-64. 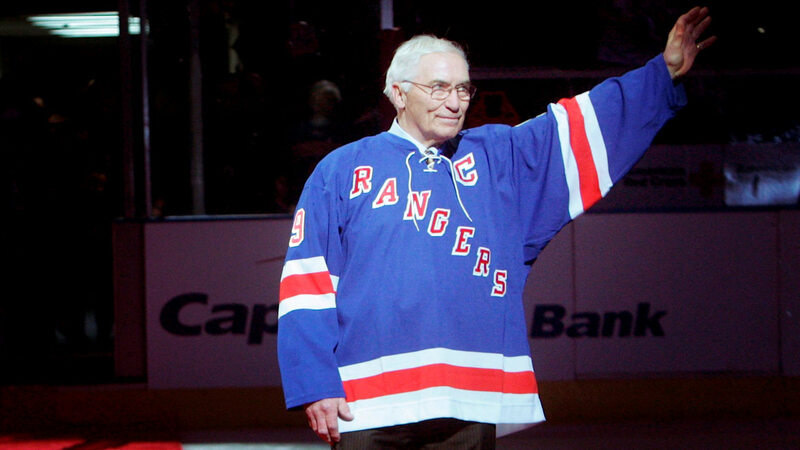 He joined the Rangers in 1952, playing in 18 games, then skated in 20 for them the next season. By 1954-55, he was a regular on Broadway - and a star in a sporting region dominated by baseball players. In 1961, he became captain of the Rangers, a perennial also-ran. When he was dealt to Toronto, Bathgate had skated in only 22 postseason games. He got into 14 that spring, scoring five goals to help the Maple Leafs win the championship.